PROSTRATIONS again and again to the blessed Divine Mother who is the source,substratum and the ultimate goal of all creation. Thirumadhamkunnu Bhagavathi Temple at Angadippuram is a divine centre of peace and prosperity to thousand of devotees who visit the temple everyday.Every devotee experiences the motherly affection of goddess Bhagavathy when he or she gets the darsan of the Idol. The sanctified adn divine atmosphere of the temple gives so much of mental satisfaction to the devotees. This is an important pilgrim centre in Malappuram. The annual Pooram festival celebrated in March /April attracts large numbers of devotees.A unique custom here is the arrival of Vellathiri in the Pooram ground to give audience to the Malayankutty, the headman of the Pana tribal community. Kalampattu is an important offering here. Mangalya pooja, Rigveda laksharchana and Chandattam are other important poojas. Thirumanthamkunnu Temple in Angadipuram is located about 1.5 km west of Perinthalmanna in the Malappuram district of Kerala state, south India. It was erected after the Angadipuram Temple. The temple courtyards are on a hilltop that provides a lovely view of the countryside spread out below. The temple is an important pilgrim centre in Malappuram, especially for the annual eleven-day Pooram festival celebrated in March and April. Mangalya pooja, Rigveda laksharchana, Chandattam and Kalampattu are the important poojas here. The temple finds mention among the 108 siva temples of kerala. Other deities include Bhagavathy, locally called as thirumandhamkunnilamma and Ganapathy, for whome the famous mangalya puja is performed. . There are ceremonies and rituals specific to this temple that are not carried out at others. The temple is historically significant, as it was the para devatha of the Valluvanad Raja. It is believed that the suicide troup (chaver) of Valluvanad Raja, started their march to attack Samoothiri during mamankam, from here. A memorial structure called the ‘chaver thara’ can be found in front of the main entrance of the temple, with this regard. The King Mandhatha of surya dynasty ruled the country for long period. He then gave away the kingdom to his successors and chose to meditate on lord Siva and attain the lord’s feets at the end. Siva was pleased with his penance appeared before the king and offered him any boon. The king prayed to the lord for an idol to worship till his death. Siva gave him the most holly Siva linga at Kailas, which was too dear to him and which used to be worshiped by Parvathy and the disappeared. Carrying the Siva linga on head mandhatha started his downward journey from Kailas and reached the hill now known as Thirumandhamkunnu.A spring with crystal clear water flowed along the northern slop of the hill. Many beautiful birds chirped in the jungle. Wild animals like lion, tiger, and elephant roamed about in the wilderness in full harmony forgetting their traditional enimity. Different kinds of trees and plants grew in the region and gave out sweet smell in to the atmosphere. The surrounding attracted the king. Feelings of idol on his head heavy he placed it on the ground at immediately the linga got stuck in to the earth. Lord Siva had gifted the linga to the king when his consort parvathy was away for her bath. When parvathy turned up for worship the Siva linga was not there. She got upset on enquiry she know that it was presented to the king mandhatha, by her husband. Being too much attached to it she wanted the linga back. Siva tolled her that he had no objection in her trying to get it back. 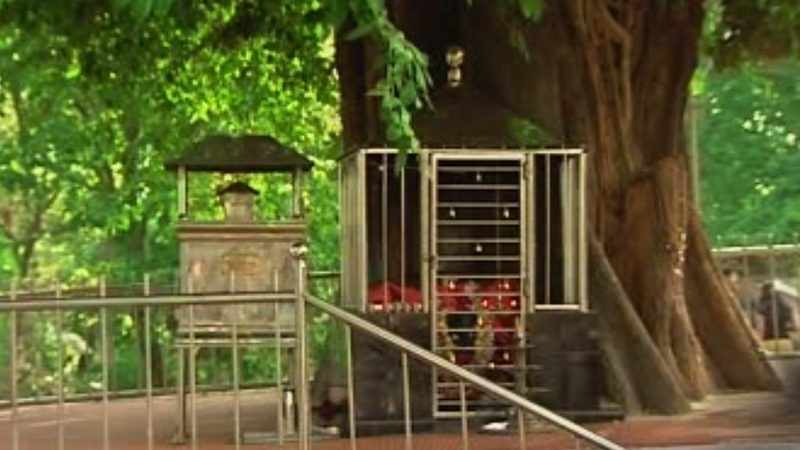 Parvathy no offered bhadrakali and a host of bhoothas to rush up and get back the Siva lingam from the king. With the army of Bhoothas Kali reached the northern slope of Thirumandha hill. The brightness emitted by the Linga installed by Mandnatha was so great that it dazzled the eyes of kali and bhoothas and they were unable to move up the hills. So they started throwing up the weapons from the foot of the hill. The ascetic attending on mandhatha were unarmed but tried to defend themselves with whatever things they had. These being insufficient to protect them they plucked Attanga nuts from their creeper plants, which were available in plenty and threw them at the enemy. Because of the power of Lord Siva and the mandra power of Mandhatha the nuts got changed in to arrows instantly. Kali and her Bhoothas could not resist them the fight lasted for 15 days. The age old custom of “ATTANGA YERU” on first of Thulam (The Malayalam month) on the new moon day of the same month in the forenoon before pantheerady pooja refers to the legendary fight between mandhatha and kali. Expecting defeat Mahamaya took her viswaroopa. She had an elephant in an ear and a lion in the other as earring. Seeing this form the ascetics fell down senseless. When mahamaya in this form reached the hilltop mandhatha was also helpless. He embraced the sivalinga kali tried to capture it by force. In this struggle that followed the linga got split into two. 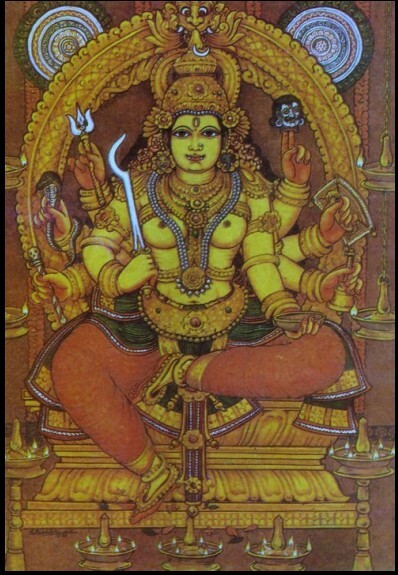 In the “Jyothis” that arose from it “THRIMOORTHIS” (Brahma, Vishnu and Siva) and Parvathy appeared on the spot. Parvathy told Mandhatha this idol was very dear to me. Still I do not want to take it away from you against the wishes of my husband. Separation from it is also difficult for me. So I will enter that linga and remain here forever. My daughter kali is not different from me. Actually she came here first. Let her also be installed near me facing north and have all poojas and festival performed. So same parvathy disappeared into the idol. This spot is the “SREEMOOLASTHANAM”. The sivalinga here is still split condition .Its position is below the “peedam” and “Prabhamandalam” and can be seen only during the abhisheka before the ushapooja and “Malarnivedia” to the deity. As ordered by Parvathy, Bhagavathy with Sapthamathrukkal, Veerabhadran and Ganapaty were installed facing north. This is called “Mathrusala”. Pooram, Pattu and all such festivals intended for this goddess. When Sree Parvathy appears infant Ganapathy was also with her. This infant ganapathy also been installed at sreemoolasthanam. Sree Parvathy appeared facing west. The installations of Sivalinga at Sreemoolasthanam were facing east. It was thus for necessary to have two darshan openings one to the east and the other to west. The family descendants of “Valluva Konathiri” do not generally open the one on the west except for darshan. On either side of the doorway here are two openings through which other worshippers can have darshan of the deity. But in recent past the restrictions has been modified. After each pooja the door is keept open for some time for darshan of the deity by devotees. Mandhatha spent many years at thirumandhamkunnu in meditation and thapusu. At last he knew it was time for him to leave this world. He was thinking of entrusting the temple to someone for perfect upkeep and maintenance when two Brahmins came there. Mandhatha told them his desire gave them a Grandha containing instructions on the performance of poojas and entrusted the shrine to them. He then retired to the jungle near by now known as “KUKSHIPPARAKKAD” and freed himself from this world of mortals by his yogic powers. Bhakthas who go round this jungle paying homage pick out a leaf from the growing plants and keep it in hair with at most reverence. This area is still a protected jungle. In the Devaprashna conducted in 1959 it was observed that an idol of mandhatha should be installed here and poojas, performed. The temple priests before pooja every Malayalam month. The annual pooja on Chithra in midhunam on Mandhatha is on special significance. Two Brahmins entrusted with the upkeep of temple, one cleared the jungle around the idol and hence came to be known as “KATTILLAMUTTAM” .The other prepared pavilion for prathishta and came to be known as “PANTHALAKODE”. The thanthri of thirumandhamkunnu temple is still a descendent from either of these families. The nair karyasthan who was with them was given the title “chathathumarar” and made the blower of holy conch in the temple. The Namboodiri’s informed the news to Vadakkara swaroopam raja that was subordinate chieftain of valluvanadu raja holding the title mannarmala raja. He immediately rushed to the spot (Seeing the over-lord of the hill the goddess got up and paid homage to him. This humility of Devi-the sustainer of three worlds-made the raja blink in shame and) he prayed to the goddess to see him as a son. He then presented an elephant to the goddess and worshipped her from its rear, standing in its shadow. His descendants also followed the same practice. Even now direct darshan of thirumandhamkunnu Bhagavathy is not permissible to mannarmala raja. The first Vallavaraja who took over the control of the temple entrusted its upkeep and maintenance to the local feudal lords “ETTUVEETIL ACHANS” and made them trusty. Erukalikara nair was made kavudaya nair. Sreemoolasthanam does not have a roof, which is an evidence of it having been a kavu. The painting on the walls of the mathrusala throws light to this legend. These paintings which are in lying with the wall painting at suchindram, Pundarikkapuram,vaikom and Guruvayoor were executed in the year 1944. The easiest way to reach here is road. It is very nearest town is perinthalmanna. And through rail you can reach here by boarding train from Shoranur to Nilaboor passenger, and you can see the Angadipuram Railway station nearly after 55 minutes from shoranur. Celebrations start in the month of Chingam with Triputhari, Ayilyam the birth day of goddess in month of Kanni, followed by Sreemad Bhagavatha Sapthaham during Navarathri, Maha Mangalya Pooja and Attanga Eru in Thulam, Kalam Pattu and Mandala Maholsavam followed by Sreemad Hrigveda Laksharchana in the first week of Dhanu. Makarachovva, Maha Sivarathri in the month of Makaram & Kumbam. The annual Pooram Festival for elevan days in Meenam, followed by Vishu, Chanthattom etc. Thus all these age old rites, rituals and cutoms gives much relief, happiness and mental satisfaction to thousands of devotees. The most important among these rituals are the eleven day long Pooram Festival. The pooram festival of this year starts on 9th April 2011 and ends on 19th April 2011.